Thank you, we will get in touch in due course. 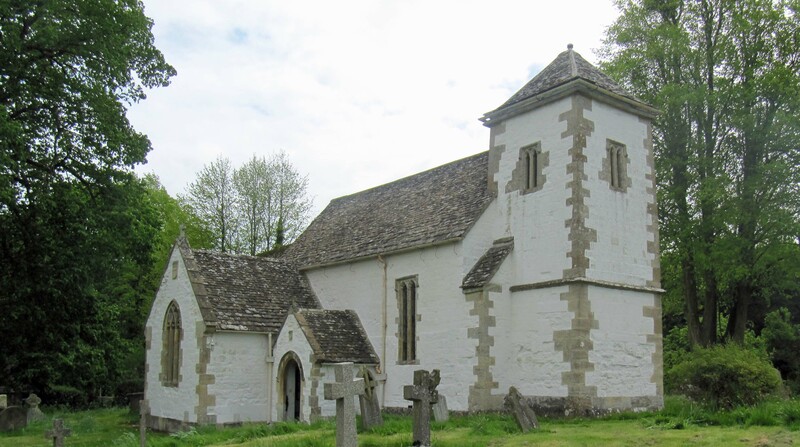 The Shrivenham & Ashbury Benefice is situated in the Vale Of White Horse, 8 miles east of Swindon and 25 miles west of Oxford, and consists of four parishes within the Dorchester Archdeaconry in the Diocese of Oxford. Our churches are all different, but are united in wishing to mirror the hospitality of God to those we meet. Regular services are held in our churches in Shrivenham, Ashbury, Bourton, Compton Beauchamp, Fernham, Longcot and Watchfield. We look forward to meeting you at one of them. A warm welcome to St Andrew’s Church Shrivenham. You will find a range of services over the course of the month, from Common Worship and Book of Common Prayer to Family Worship and Prayer and Praise - hopefully something for everyone! Our main Sunday service is at 10:15am (usually Family Communion), with Holy Communion at 7:45am on the first and third Sundays of the month, and Compline & Benediction on the first Sunday of the month at 6pm. We meet for Morning Prayer at 9am on Tuesdays. Children are welcome at all of our services, and a special area with colouring materials, toys and books is provided. Our family service is held on the first Sunday of the month and includes prayers and readings led by the children, contemporary songs and participation with musical instruments. Baptisms also take place during this service. Jointly run by the Methodist Church and St. Andrew’s, this ‘pop-up’ Café meets in Shrivenham School on the second Saturday of the month between 10 and 11:30am. All ages are welcome to come along for tea and coffee, bacon rolls, homemade cakes, newspapers and friendly chat. Younger guests can play with a range of toys or join in craft-based activities. We have a short "Thought for the Day" when matters related to Christian beliefs and/or current affairs are considered. Shrivenham Baby & Toddler Group meets in St Andrew's from 9 - 11am on Thursdays during term-time. Lots of fun with crafts, toys, games and a snack, with refreshments for carers. Suggested donation £1. Join us for a Full English Breakfast and a chat in the Prince of Wales at 8:30am on the third Saturday of the month. Worship and Praise with live music and contemporary & traditional songs from 5:30 – 6:15 pm on the third Friday of the month. The Benefice choir is based at St Andrew's and leads worship on at least one Sunday each month. It supports services at all of the churches as well as concerts and special Christmas services. They practice at 6:30pm on Thursdays - new members welcome. There is also a keen band of young servers who process, carry the cross, candles and banner and serve the minister during the service. The tower houses one of the best rings of ten bells in the county, cared for and rung regularly by an enthusiastic team of ringers. They practice at 7:30pm on Mondays - come along if you would like to find out more. The handbell team is active across the Benefice with performances in Christmas services, concerts and at Café Inspire. The tower predates the rest of the church by about 300 years. It was built in around 1400. It is assumed that there was an earlier tower, which housed the little 1cwt Sanctus bell which is thought to date from about 1320 and is still in daily use. They were replaced by Mears and Stainbank by a new ring of six bells in 1908. Gillett & Johnston of Croydon cast two further bells in 1948. These were a gift from the American & British forces stationed at Beckett House in WW2. The ring was increased from eight to ten bells in 2003 when the Whitechapel Bell foundry cast the present treble and second bells. There has been a church on the site of St. Andrew’s for over 900 years and it is mentioned in the Doomsday Book. 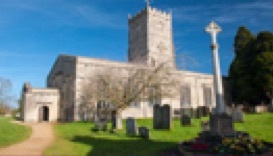 It was marked out as one of England’s 1000 Best Churches in Simon Jenkins book. With the exception of the 13th century tower and a small bit of the west wall, the church was built during the reign of Charles I, at a time when there was very little in the way of church building taking place in England. As such, it presents a rather unusual style - a merging of late Perpendicular and Classical. The medieval building was dismantled in 1638, leaving intact only the tower with its crossing arches. Long arms were built from each of the tower arches to create the building we see today. You enter through a paved 18th century west porch, where there is a royal coat of arms to George III, dated 1764. The lead panels are thought to originally have been incorporated into the roof. As you enter the church itself you will find a sense of space and light; the nave roof seems to soars above your head, but the roof supports are not aligned with the slender elongated Tuscan columns. The huge Perpendicular windows let in an enormous amount of light, like the space between the columns they are rounded at the top but only on the inside of the church. The font is late 12th/13th century and is made of black Purbeck marble. Within the church there are a number of monuments to members of the Barrington family, major benefactors, who lived in Becket House, now part of the Defence Academy. These monuments are numerous and some are very grand but of particular interest, tucked away in the North West corner is a monument in white marble to Admiral Samuel Barrington, a naval hero who in 1759 captured the French vessel Count de Florentine off St Lucia. The French captain's white flag of surrender was brought back to St Andrew’s church. As you move to the east end, the oak pulpit is of Jacobean design and used to have three levels. In the chancel is a lovely brass chandelier dated 1726. The chancel floor is very striking, with a black and white design in marble. The east window has the only coloured glass in the church, including an image of a bishop with the date 1505. This may be John Hawkborne, Abbot of Cirencester Abbey which owned St Andrew's until the Reformation. The chancel walls have wonderful late 17th and early 18th century memorials, including that of Sir John Widman (d. 1693), a fascinating character who in 1683 was implicated in the Rye House Plot to kill Charles II. He later supported the Duke of Monmouth's abortive attempt to seize the throne, before throwing his support behind William and Mary. When William and Mary's bid for throne succeeded, Widman bought the position of Postmaster General. He was knighted in 1692, but died the following year. The Lady Chapel is not dedicated to Mary the mother of Christ but rather unusually to Mary Magdalen. There is a hanging 18th Century ‘Pyx’ for the reserved sacrament, one of only about half a dozen known examples in the country. In the south aisle there is a much worn 13th century effigy which is probably a woman, but it is so worn as to make all identification pure conjecture. On the wall above this hangs the Benefactions board from 1786 which was restored in 2012. A more detailed description and guide book is available inside St Andrew’s. The Benefice has a growing lay ministry team who help in all aspects of the churches’ life and mission. We are a very open and welcoming congregation. Our Sunday services start at 11.00am, and over a month we celebrate Holy Communion, Morning Worship and a third Sunday service with Taizé, Celtic or other forms of worship. We also meet on Thursdays at 8.00am for Morning Prayer. The village shop and café welcomes us for a bi-monthly ‘Café Church’ which usually includes a guest speaker. A highlight of village life is the Stations of the Nativity just before Christmas each year, in which the Christmas story is retold around the village. Men's Breakfast is held in Ashbury Village Hall on the last Saturday in the month at 8am. Everyone is welcome (you don’t have to live in Ashbury) and we provide a full English breakfast plus the chance to talk and put the world to rights. There is no charge but we do ask for a small donation to cover costs; any surplus is donated to charity at Christmas time. This monthly discussion group will meets at 8am on the first Saturday of the month at various different venues. Everyone is welcome; we generally have a simple (but excellent!) breakfast before looking at the bible passage for the following week and see where the conversation takes us. St Mary’s is the parish church for Ashbury, Kingston Winslow, Odstone and Idstone. The first church in Ashbury was built for the Abbot of Glastonbury sometime before AD 947, with the present church constructed on the same site in the twelfth century. The building would probably have been cruciform in plan, with a nave and entrances to north and south. Through the ages the church has been enlarged and altered to make it the building it is today. The west end is 12th century, the chancel with its three medieval brasses is 14th century and the tower and north and south chapels are 13th century. A detailed history can be found in the church. The tower originally housed five bells, which were cast in 1733 by Henry Bagley III. The two largest were recast in 1845 by Taylors of Oxford, and a treble by Mears &B Stanbank was added in 1873. There is also a Sanctus bell, cast in 1800 by James Wells of Aldbourne. In the latter half of the 20th century, the bells were partially rehung and this resulted in the bells being in the order 6, 5, 4, 3, 2, 1 which is “anticlockwise” and thus rather unusual. As well as ringing for services, the ringers meet to practice on Thursdays at 7:30pm. Our parish churches span the breadth of church tradition, with modern, traditional, and non-traditional services found in the regular pattern of worship. Find out more below. We welcome adults and children alike to our Family Service at 10am on the first Saturday of the month and Family Communion at 9am on the third Sunday. We hope you will stay for refreshments and a chat afterwards. Messy Church, with creative activities for children, focuses on key events in the Christian year and is held regularly in the Village Hall. The highlight of the year is our candlelit Holy Communion service on Christmas Eve at 6pm, where the village children dress up as various members of the nativity to build a living crib, along with mulled wine for the adults and the traditional handbells rung by the Shrivenham bell ringers. 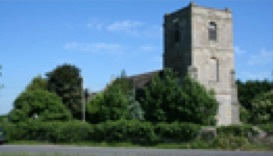 St James is located on the outskirts of the village of Bourton in the direction of Bishopstone. It was founded and built in 1859 following the purchase of a plot of land by Mr T. Tucker, and its foundation stone was laid on August 8th of that year by Jane - Viscount Barrington. Prior to this the village had no church, and villagers would meet in a hut at the bottom of The Hill to worship. 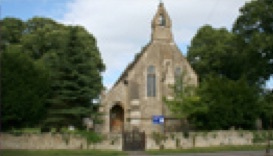 Bourton is a small village, but the church remains important both to the villagers and to Pinewood School, who hold regular services there when Saturday school is in session. Village services welcome adults and children alike to enjoy the service, but also coffee and biscuits following it. Please visit www.bourton-oxon.org.uk for details of the latest service times and our fundraising activities. Situated as it is in the grounds of Compton House, St Swithun’s may (at first sight) appear to be a private chapel. However, it is not and all are warmly welcome to enjoy the prayerful peace of its interior. We have two regular 9am services each month - Holy Communion on the first Sunday and Matins on the third Sunday, both using the Book of Common Prayer. Other services include our Patronal festival in July, Remembrance Sunday and a candle-light celebration of Nine Lessons and Carols at Christmas. St Swithun's has a long-standing connection with St. Stephen's House in Oxford and students come to celebrate Mass according to the English Missal once a year. 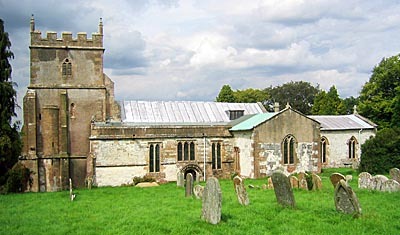 St. Swithun's Church is considered by its worshippers and many visitors to be the jewel in the Benefice crown. Certainly, it appears both in Simon Jenkins’ 'Thousand Best Churches' and Richard Wheeler's 'Oxfordshire's Best Churches.' Even the 14th-century bell merits four pages in the Church Bells of Berkshire! Built of chalk and clunch, this 13th century cruciform church is unusual in that most of the internal furnishings date from the 20th century. These were commissioned by Samuel Gurney, an Anglo-Catholic who lived in Compton Beauchamp from 1924 until his death in 1968. He employed the artist Martin Travers to redesign the interior, which was completely reordered between 1925 and 1950, creating a beautiful, sacred space within the tiny building. The church itself is surrounded by beautiful countryside and by its very positioning encourages a feeling of stillness, contemplative thinking and an engagement with nature. It sits below the ancient Ridgeway track and is on the Diocesan Pilgrim Route. St John's is at the heart of the village, with Sunday services every week – Holy Communion at 9am on the first and third Sundays, Morning Worship at 9am on the second Sunday and Evening Worship at 6pm on the fourth Sunday of the month. 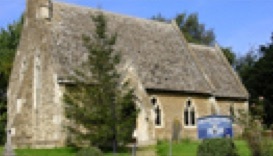 In a joint venture with the Fernham Village Trust, the church has been adapted so it can also be used as the Village Hall. It is now used regularly for village events and Annabelle’s nursery meets daily in term time. Although 13th century gothic in style, St John's was in fact built in 1861 by the Gothic Revival architect JW Hugall to serve as a chapel of ease for Longcot. It underwent a major re-ordering and refurbishment project between 2005 and 2010, which preserved the best of the church building including the font and some lovely stained glass, but added a beautiful new oak floor, a small but well appointed kitchen, a toilet, comfortable chairs and excellent IT facilities. This makes it a very versatile venue for village events, private hire and Benefice meetings. St Mary's is a lovely parish church whose shape seems to reflect that of the village it serves. There are three Sunday services every month – Family Communion at 9:30am on the second and fourth Sundays and Evensong at 6pm on the third Sunday. We join the local Methodists in their chapel on the first Sunday of each month at 3pm. Evening prayer is said on Tuesday evenings at 5pm, apart from the first Tuesday of the month when we celebrate Holy Communion. St Mary’s church dates back to the 13th century, with a large barn-like nave, small chancel and an 18th century tower. The nave was repaired in 1606 and again in 1701; other parts of the building reflect later repairs and additions, and we look forward to being able to add a toilet and kitchenette as the 21st century’s contribution to maintaining the life of the church and its place at the centre of the village. Within the building there is a font which probably dates from the 13th century; a hexagonal pulpit of fine Jacobean oak work and a wonderful 1733 painting of the arms of George III. In addition, there is a plaque in memory of Lillian Carter who, with her husband, lost her life on the Titanic in 1912. 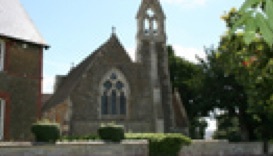 Lillian’s uncle, John Hughes, was vicar of Longcot from 1853-1895 and the chancel was refurbished in his memory. The churchyard is managed by a team of volunteers and includes a wild-life garden which has won a number of environmental awards. The original tower collapsed in the early 18th century, taking the bells with it. It was rebuilt and a new ring of five was installed by Abraham Rudhall of Gloucester in 1722. Seven years later, Rudhall added a sixth bell. This installation remained in use until the early 1960s when the bells became too difficult and dangerous to ring and fell into disuse. Ringers from Shrivenham progressed a “Millennium” scheme to make the bells ring again, and in 1998 they rang out as a ring of eight. The two extra treble bells were cast at the Loughborough foundry. There is also a 1909 Sanctus bell (½ cwt) by Warner’s of London replacing its predecessor of 1845 by W Taylor of Oxford. We have an active bell ringing team and the tower is a flourishing teaching centre for the Benefice, the Deanery and the surrounding area. New ringers are always welcome - come along to the Friday evening practice at 7:30pm and see how it's done! We are a friendly and welcoming church offering a more traditional style of worship, using the Book of Common Prayer. Sunday services start at 9am and alternate between Matins on the first and third Sundays of the month, and Holy Communion on the second and fourth Sundays. St Thomas's was built in 1857-8 by G E Street, an earlier church having been demolished in 1788. It is plain Gothic in style, made of rubble stone with dressed stone buttresses, copings and openings and gabled stone tiled roof with bellcote. Inside there is a three bay nave, one bay chancel, and a north aisle. In an otherwise plain interior the north aisle has deeply undercut capitals of almost perpendicular style and deeply splayed windows with eyebrow dripstones. The roof is open rafters with scissor beams and simple cusping. There is a transitional style font with nebule enrichment, a fine candelabra and an 1860 stained glass east window. The roadside west front has an elaborate interplay of buttressing which includes a central buttress that changes in direction six times before it reaches the bellcote. For details of weekday services and forthcoming events, please download the Newsletter from our homepage. The Church is here for everyone, whether or not they are regular churchgoers. Many people turn to the Church at significant milestones in their life. Whether that is a happy event such as a wedding or the birth of a child, or a sad one such as the death of a loved friend or family member, we’re here to help, so please get in touch. Your child is precious to you and precious to God, and you may wish to mark the birth with a special service of celebration. We offer two alternatives: a simple service of thanksgiving for the birth of a child or a christening service which includes baptism, marking the start of a journey of faith. We would love to welcome you and your family to one of our churches, so please get in touch. Find out more about the service of christening and baptism. Are you planning to get married? Congratulations! Whether you plan to get married in a couple of years or in just a few months, we would be delighted to share your special day with you, and help you through the process of booking and planning your ceremony, so please get in touch. You can find out all about getting married in church at the Church of England’s special weddings website. There’s a ceremony planner, FAQs and lots of useful resources to help you plan your special day. When somebody you love dies, there’s a lot to think about and it can feel overwhelming at the time. Our Ministry Team is here to support you in your loss, so please do get in touch. A funeral marks the end of a person’s life here on earth, as family and friends come together to express grief, give thanks for the life lived and commend the person into God’s keeping. There are some useful resources on the Church of England website which may help you to start thinking about the service you would like for your family member or friend. We hope that you will join us at some of our events and look forward to meeting you. The care, nurture of, and respectful pastoral ministry with, all children and all adults. The safeguarding and protection of all children, young people and adults when they are vulnerable. The establishing of safe, caring communities which provide a loving environment where there is a culture of 'informed vigilance' as to the dangers of abuse. For more information please download our Safeguarding Policy. Regardless of circumstances, if you see or hear something which makes you think that a child, young person or adult may be being neglected or abused in any way, you should not hesitate to report your concerns to the Vicar or the Benefice Safeguarding Officer. Do not attempt to investigate or resolve the situation yourself. If a child or adult is in immediate danger, or requires immediate medical attention, call emergency services on 999. We take the responsibility of how we manage the data and information we hold seriously. We recognise that churches can be complex places where information is held in a number of areas and by a number of people who work or volunteer with us in many different ways. Find out more by downloading our Data and Information Policy Statement and Data Privacy Notices.